An important season for UIPM Sports in Asia began when Kuala Lumpur hosted the UIPM 2019 Global Laser Run City Tour on March 30. 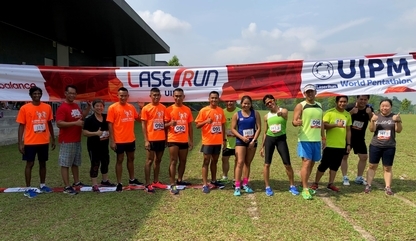 There were 140 Laser Run participants in the Malaysian capital, with neighbouring countries Singapore and Thailand supplying competitors across the 16 categories. It was the second consecutive year that Kuala Lumpur had hosted the GLRCT in March. A spokesperson for the local organising committee said: “The Global Laser Run City Tour, Kuala Lumpur, Malaysia 2019 went smoothly on a bright and sunny morning. It was great to see everyone enjoying themselves. With the Tokyo 2020 Olympic Games coming up next year, this season will provide many opportunities for the development of UIPM Sports at various levels. The UIPM 2019 Pentathlon World Cup Final will take place in Tokyo (JPN) in June 2019, doubling as a test event for the Olympic Games. In December, Laser Run and Triathle will feature for the first time in the 30th Southeast Asian (SEA) Games in the Philippines.